Jon Athan: "Mr. Snuff" is now available for pre-order! His daughter was slaughtered for a snuff film. His target is an enigmatic man with a sinister business. Russell Wheeler, an enforcer-turned-contractor, will stop at nothing to exact his revenge... 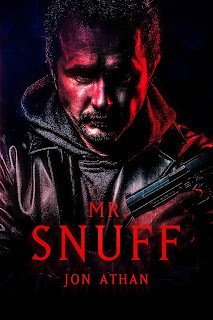 I am proud to announce my next book, Mr. Snuff. Join Russell Wheeler on his journey to cripple Mr. Snuff's wicked business. Armed with his handy framing hammer, Russell will clobber anyone in his path in his search for vengeance. The trek, however, will take him to the pits of hell... Can the distraught father avenge his slain daughter? Or will he fall victim to the deviance? Mr. Snuff will be available on May 12, 2016. You can pre-order your Kindle copy today for $2.99. You can also add the book to your wishlist and read it for free using your Kindle Unlimited subscription when it releases. Regardless, thank you for the support. I hope you enjoy this wicked horror/thriller hybrid.